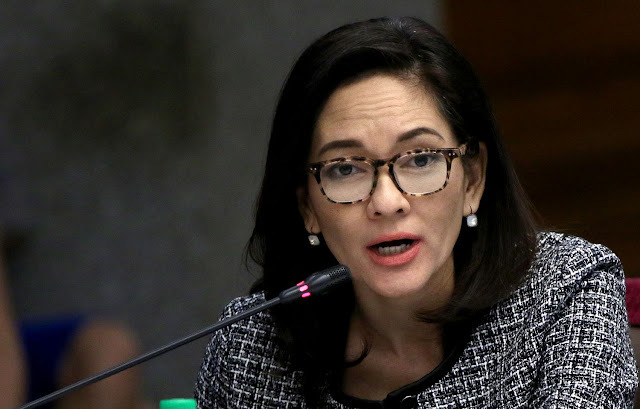 MANILA -- Malacañang on Friday refuted opposition Senator Risa Hontiveros’ “destabilizer-in-chief” remark against President Rodrigo R. Duterte, saying the chief executive continues to gain high public acceptance. “It is ironic that Senator Risa Hontiveros, who spends so much of her time undermining the efforts of this administration, would refer to the President as ‘destabilizer-in-chief’,” Presidential Spokesperson Harry Roque said in a statement. Last Thursday, Hontiveros hit Duterte for accusing the opposition of plotting moves to unseat him. Roque defended Duterte, saying the President has made “significant strides” in his election promises to fight illegal drugs, criminality, and corruption. “There is high public appreciation and acceptance of his actions,” Roque said. “Many Filipinos agree that when there is peace and order, the economy thrives. Adult joblessness as well as crimes are decreasing,” he added. Roque emphasized the need for all government officials to focus on helping the Filipino people, particularly those affected by landslides in Itogon, Benguet and Naga in Cebu. “During this challenging time when the nation must stand as one because of the tragedies that befell our farmers from Northern Luzon, the miners of Itogon, Benguet to the residents of Naga, Cebu, what our people expect is a moratorium from excessive politicking from our elected leaders,” Roque said. Duterte is set to visit on Friday afternoon the victims of a landslide in Naga, Cebu that reportedly killed 15 people. Reports said dozens remained missing in the landslide set off by heavy rains last Thursday.